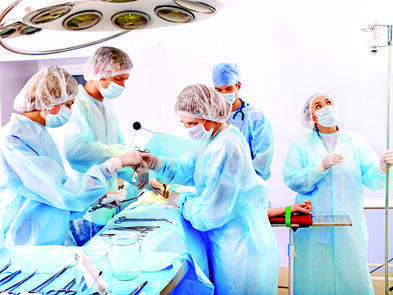 Evidence reveals that although hospital personnel take the utmost care and precaution before, during and after a surgical procedure, infections do occur. There are some interesting reasons for this. All humans carry a certain amount of bacteria, fungi or parasites in their bodies. Some of these microorganisms thrive harmlessly in the intestinal flora, hair and skin. Depending on the type of surgery, some medical practitioners prescribe antibiotics before performing a surgical procedure to prevent infection. This preventive measure may be successful in some cases, but on the other hand, it can make bacteria become extremely resistant to antibiotics, raising the likelihood of an outbreak. When an incision is made in any given patient, the underlying tissue is exposed to the overlying flora that resides on the patient’s skin. So, even if skin has been properly cleaned and prepared for surgery, microorganisms find their way into other layers, posing a risk to the patient’s health. An infection can occur by giving bacteria a pathway into other usually sterile organs and areas of the body. Therefore, surgical instruments remain the most important root, in spite of sterilization, for SSIs to occur. They can easily become contaminated during a surgical procedure through contact with the patient’s skin flora, or through contact with microbes residing in the organs and underlying tissue in the body. In a case study conducted in Japan3 to determine the relationship between the incidence of contamination of surgical instruments and SSIs, it was demonstrated that, surgical instruments tend to get contaminated during surgical procedures due to microbes that inhabit several layers of skin and internal organs. In this study, 140 forceps were found to be contaminated out of 24 laparotomy procedures. In conclusion, although appropriate practices were followed, it is evident that surgical instruments can act as fomites for pathogens of SSIs. This finding yields another important surgical consideration. While it is known that single-use instruments highly reduce cross-contamination and SSIs, it poses the question whether a single-use instrument should be used for only one incision, one cut, to grab just one single tissue or to hold only one organ in place. In any case, the patient’s well-being should be the most important concern for all healthcare practitioners. In the near future, more single-use instruments will be needed to perform flawless surgeries, which will result in the reduction of SSIs to a minimum. 1Anderson, Deverick MD (2015, September). Epidemiology of Surgical Site Infections. 2Spruce, Lisa DPN (2014, May). Back to Basics: Preventing Surgical Site Infections. 3Saito, Yuhei RN (2014, January). Microbial contamination of surgical instruments used for laparotomy. Dancer, SJ. (2012, August). Surgical site infections linked to contaminated surgical instruments. National Action Plan to Prevent Health Care-Associated Infections: Road Map to Elimination. (2016, July). Uçkay, IIker (2010, August). Preventing Surgical Site Infections.